Industrial rustic never looked so fabulous! Happy Endings Barcelona put together this wedding shoot to inspire brides to think beyond your typical winter decor. Using a rich color palette of blue, gold, brown and purple, all of the rustic and industrial elements fall into place beautifully to create a one-of-a-kind space with an easy laid-back, yet sophisticated vibe. 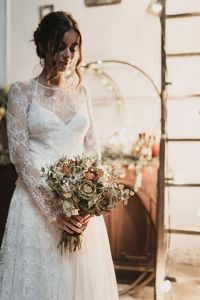 Believe us when we say you won't want to miss any of these beautiful images from The Visual Partners, see the rest of this industrial rustic wedding here.